This past weekend, Los Angeles’ Exposition Park saw the presence of thousands of fans for KCON 2014, looking to delve into different aspects of Korean culture with food, music, and overall entertainment. While most of the panels and workshops gave attendees great insight on several topics, it’s safe to say that everyone who purchased a ticket for KCON did it with the intention of seeing the artists in the incredible two-day lineup for M! Countdown. Check out these cool articles around the web. What Can We Expect from BTS’ “Dark & Wild”? Before inciting EXO-L (exotics? ), let’s look at the facts: If you attended KCON last year, you’ll remember the sea of fans wearing EXO apparel at the event and the frenzy the boys created at the concert. They were so arduous that it was even easier to hear the fans singing along to Wolf rather than the group itself. This happened again this year, but with BTS. Throughout the day, ARMY could be easily spotted from their fan apparel and cosplay. And who could forget the wails heard throughout the arena once the boys levitated from the platform, or even the fan chants (which don’t necessarily always happen at U.S. events)? This made Rap Monster’s reiteration of their group’s name sound funny when it was clear that half of the audience was there to see them. 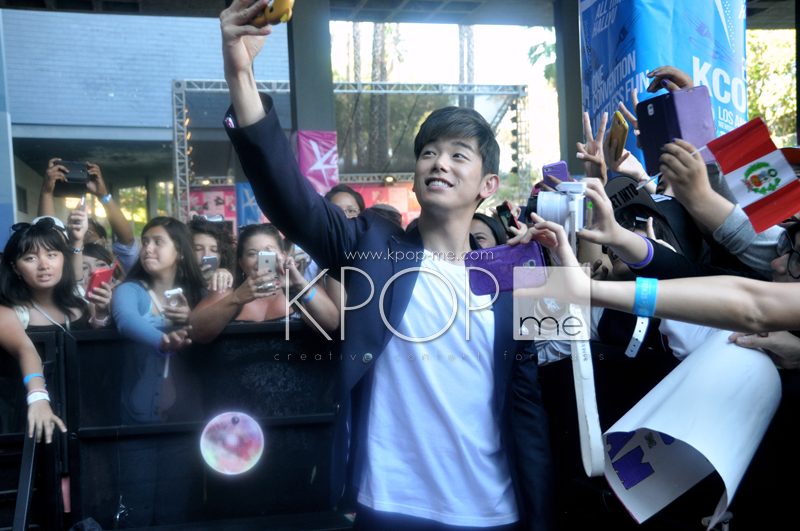 Viki brought Eric Nam to KCON as their special guest, where he held meet-and-greets with fans on each day of the convention. Furthermore, he also served as the host for the two red carpet events (one for each day), where fans and press met the artists for quick questions and pictures. During the fan meetings, the line at the Viki tent extended well into other areas of the Marketplace. Many fans lined for their chance to get a selfie with Eric, since this was open to everyone and didn’t require a card like the other fan meetings with the performing artists. Eric received every fan with a great smile, seemed genuinely thankful when hearing compliments, and was as chatty as ever. Furthermore, during the red carpet events, Eric interacted with the fans more so than the featured artists themselves. He responded to their screams, sang bits of Ooh, Ooh, and even stayed behind after the event ended to take many pictures with fans. KCON marked Girls’ Generation member Taeyeon’s first concert appearance since hell broke loose with her dating scandal involving EXO’s Baekhyun. Right from the start, the leader had a somber look and didn’t appear as her fierce self, seeming a bit disengaged when she opened up their set with Mr. Mr. Was she reluctant about the audience’s response? Did she fear another black ocean? We might never know, but what we do know is that, by the end of their performance, Taeyeon had warmed up to the audience. Maybe this was due to fans’ holding up messages commemorating Girls’ Generation seventh anniversary, saying they would always support the group. Or maybe the fans’ reception of them and their songs gave her confidence. But, again, this is only speculation. 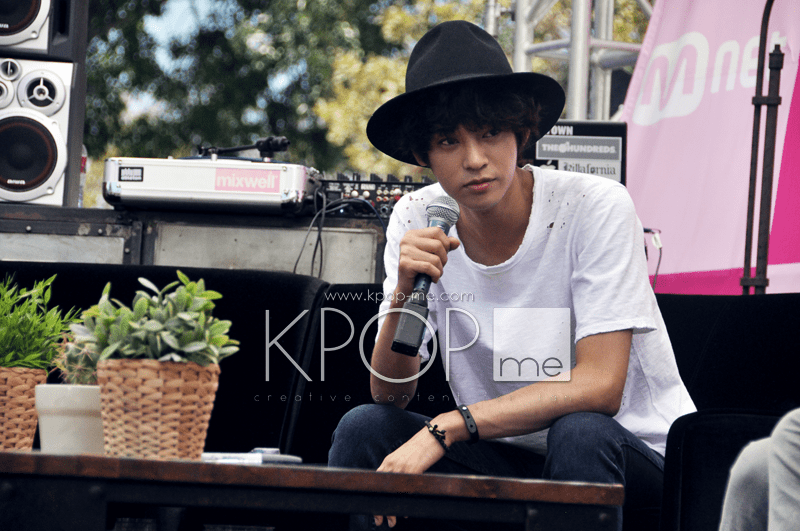 Throughout Jung Joon Young’s multiple KCON appearances, the rocker made it a point to separate himself from the idols joining him on stage. How he did this? Well, by being real — or realer, for that matter. During the Danny from L.A. taping and the red carpet event on August 9th, Joon Young repeatedly said he felt sleepy and showed no signs of fake amusement. Even at the red carpet, when Eric tried to get some kind of emotion out of him, Joon Young stuck to his guns and only proclaimed that he was tired, and smiling for fans and photographers briefly. While this kind of behaviour would be seen as rude from idols, it serves the rocker’s bad boy image that we see in similar artists. Despite IU being pretty well-established in Korea, KCON was the singer’s first U.S. performance. In order to introduce herself to American fans for the first time, IU spoke exclusively in English, apologizing for what she thought was sub-par English. This, of course, wasn’t true. Compared to other acts, IU was a native speaker. While she was hesitant upon every uttered word, her deliverance was spot on and intelligible. 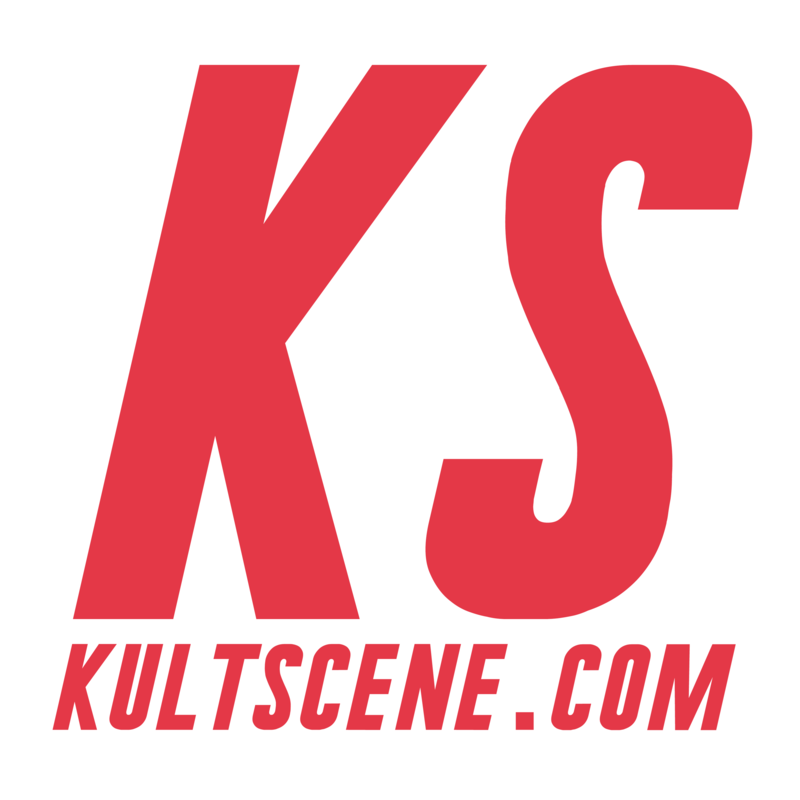 The Asian American Artists panel at the convention featured rappers Shin-B and DANakaDan, producer Jeff Bernat, and singer Jhammel, highlighting the acts’ popularity among con-goers. They all even held fan meets and performances on the outdoor and main stage throughout the weekend with great turnouts, which showcased not only their innate talent, but their ability to hold their own in an event with foreign language-speaking headliners. When you hear “Hallyu,” the first thing that generally comes to mind is K-Pop, right? I mean, the Korean Wave’s poster child has to be Korea’s number one cultural export. Wrong. As Euny Hong points out in her book, The Birth of Korean Cool, and at the Hallyu Culture Shock panel, in which she participated, Korea’s main cultural exports are video games, not K-Pop. This came as a surprise for an audience who was used to the association of “Hallyu” and “K-Pop” together. Truly eye-opening, indeed. Did you attend KCON this year? Share with us your experience! And be sure to follow us on Facebook, Twitter, Instagram, Tumblr, and Bloglovin’ so you can keep up with all our posts. KCON 2014 Day 2: M! Countdown 2 Nights in L.A.